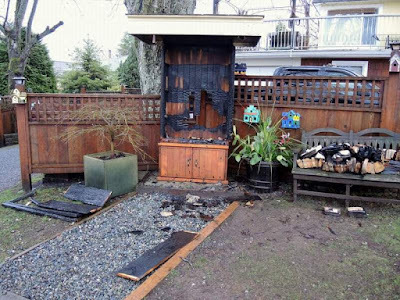 Nanaimo-Info-blog: Fire Destroys Local Library - 102 Pine St.
A 40 year handmade cedar gun cabinet, used as public library, providing books to a local neighbourhood has been destroyed by fire. The cabinet was located outside 102 Pine St, near the intersection of Pine and Wentworth St. The Nanaimo RCMP is investigating and has determined it was deliberately set. The fire was reported at approximately 9:20 pm on Wednesday January 20th. The blaze was so intense that fire extinguishers brought out by nearby residents could not control it. Fire crews were called and extinguished the blaze. The library, used by local families and had been the focal point of the neighbourhood. "Many local children would stop by on their way home from school to select a book. It was quite unique and the books provided many hours of reading enjoyment to the young and old alike," said Constable Gary O'Brien of the Nanaimo RCMP.